In college I built a 55 gallon drum BBQ grill. Since we were poor college students it was made out of whatever we could scrounge. The base was made from shelving scavenged from the grocery store I worked at. The grates were made out of refrigerator shelving. And when it came time to make the handle, I splurged and bought an axe handle. For some reason it seemed perfect. The grill lived on our front porch for three years, and after we graduated it migrated up the the upper peninsula to our deer camp, where it provided a couple more years of service before eventually rusting out. I wish I had some pictures of it, but alas I don't. Before it was sent off to its final reward, I removed the axe handle and put it in the toolbox in the truck. That was probably 5 years ago. 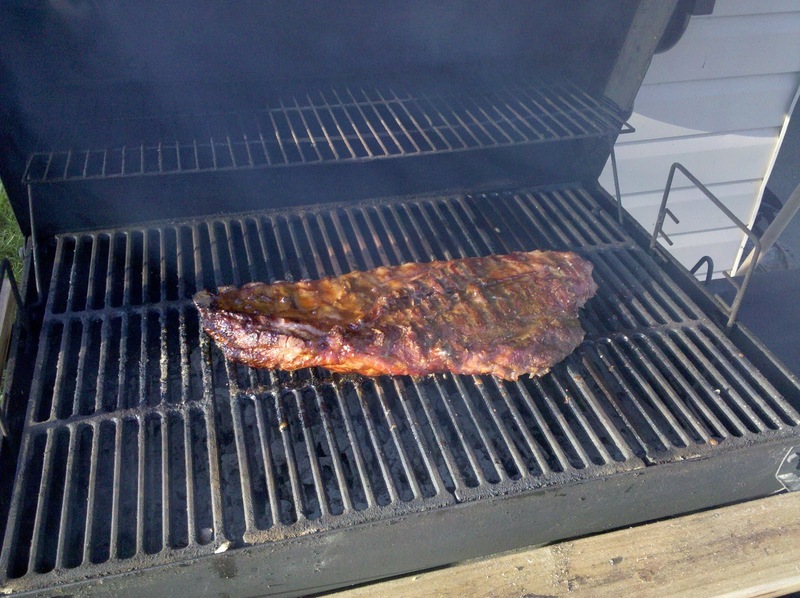 This last year I bought a new BBQ. My garbage picked Weber kettle finally gave out. It died like most of them do, one of the leg mounts rusted and broke off. While I was cooking. I ended up buying a Char Griller Super Pro from Lowes. I love it, but the handle seemed wimpy. That's when I remembered my old axe handle. I dug it out of the toolbox, cleaned it up, and mounted it. 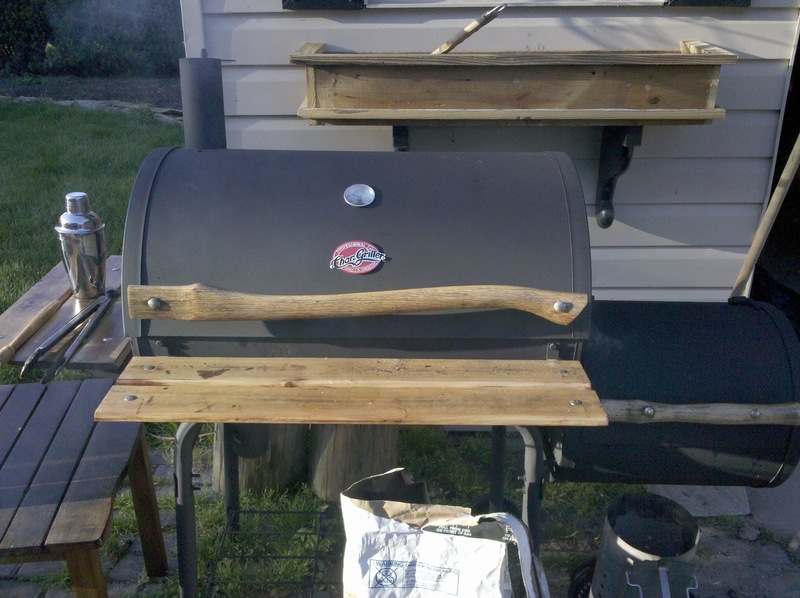 Later I ended up adding the smoker box on the side, so I went out and bought a hatchet handle. Oh yeah, I built that planter box behind the grill. 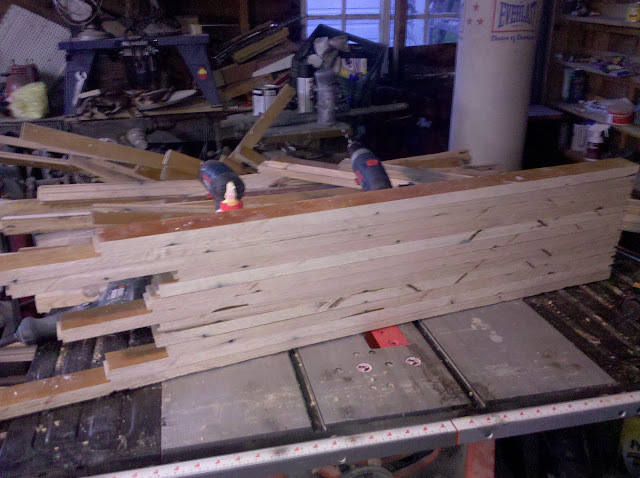 I made it out of some scrap wood to replace the ones that came with the house, which had rotted out. It is now painted black, and is also a piece of crap. I am really not very proud of it. I will allow it to exist for this season, but next year it's gone. As was hinted in a previous post, here is what became of some of the hardwood flooring that we pulled up when installing the slate floor. I riped off the tongue side of the wood and screwed and glued it together face-to-back (as opposed to side-to-side). The surface was pretty rough, but it planed and sanded out pretty well. I also wasn't going for a perfect surface. I wanted that expensive restoration hardware reclaimed wood look. So, a little wood filler (which gives the nail holes and flaws some character) and a few hundred passes with the belt sander and it came out exactly as I hoped it would. I have had a little mig welder for a couple years now, but have never had much of a chance to use it in a big way. I also didn't really now how to use it, so there was a steep learning curve on this project. If I could quote a friend, "I'm not a very good welder, but I am a great grinder". Anyway, I bought some box steel from Lowes, and kind of shot from the hip while building the bases for these. I am pretty happy with them. I ended up being really focused on making the coffee table, and I forgot to take any pics, but I did document the making of the side tables pretty well. Coincidentally, the shelf is exactly big enough to hold my laptop. I would like to take credit for thinking of that, but it was pure luck. While working with the floor, I found a sticker from the original lumber yard that the wood came from: http://www.chickasawbrand.com/. So, I present the Chickasaw Collection. The casters make the coffee table really convenient for pushing away after consuming way to much food. The total cost of materials was well below $200, which is a hell of a lot cheaper than anything at Pottery Barn. Now I should have just enough wood left to build the entertainment center. After dicking around for a few years thinking about buying one of these bits, I finally did. Totally worth it. To mount the bases to the tops I drilled a 1/4" hole in one side of the tubing, and a 1/2" on the other, and used hardened steel screws with heads big enough to pass through the big hole and mount from the inside. Keep mineral spirit soaked rags away from wherever you are welding. I was tacking the shelf portions in place, and my left arm started to feel warm. Warmer than it should from just welding. I removed my goggles in time to see a two foot high flaming rag on my bench top. A spark from the welder must have hit it. Stupid mistake. I do have a fire extinguisher about two feet from where I was, but I was able to pick it up pretty easier with the welding gloves and throw it on the fire pit.